With England seeking a new generation of batsmen following the retirement of Andrew Strauss and exclusion of Kevin Pietersen, it appears Somerset's Nick Compton has timed his rise to perfection. After finishing the domestic season as the County Championship's top scorer with an impressive 1,191 runs from 11 matches, batting at number three, he gave selectors no choice but to take notice. Compton received his first international call-up for the winter tour of India on Tuesday - but he would have you believe it was all part of a masterplan. "I didn't just wake up at the beginning of the year and suddenly have this form," he told BBC Sport. "England has been on my mind for the entire season. I've been working really hard and taken it to a new level." At 29, Compton is no rookie. He has sauntered through eight years of the county game without catching the eye of the international selectors - bar a brief stint in the England A squad in 2007. Until this year, it could be argued he was more famous by association as the grandson of England great, Denis, whose prodigious, but unorthodox talent made him the Pietersen of his era. Compton, born in South Africa and schooled in Harrow, crept onto the scene at Middlesex, making his first-class debut in 2004. Two years later, he produced a career-best 1,209 first-class runs for the season - but after that came a dismal following summer, with just 385 runs. The inconsistency during his time at Lord's led Compton to look elsewhere in 2010, eventually settling on a move to Taunton. There was to be no instant cure, however, as he scored only 465 runs. That prompted him to radically re-shape his game. Instead of seeking crowd-pleasing fluency, he went back to basics and decided that improving his concentration and occupying the crease for long periods was the best way to realise his international ambitions. "I've made technical changes - I stand a little bit taller and play the ball a bit later, which in my early years was a problem for me. "When you're growing up you're trying to find the game that suits you. "But it's difficult because you've got so many players around you who are doing all sorts of things. Your eyes light up and you want to play like that. "You want to be like Brian Lara or Sachin Tendulkar, but the old cliche says you can only be yourself." And adopting that mantra paid off instantly. Compton was on track to score 1,000 first-class runs by the end of May - a feat which had not been achieved since Graeme Hick's prolific exploits in 1988. Bad weather at New Road denied him the accolade, but he reached the target the following day and his reward was a place in the England Lions team. A back injury interrupted his progress but he rounded off the season in style with 155 not out in Somerset's final game of the season to help his side claim second spot in Division One. And now, an England debut is on the horizon. "If you go back a few years, it wasn't in my mind," he admits. "I was very focused on fitting in at Somerset. "My focus remains there but as my performances have got better and consistency has come, you start to get a bigger profile and realise you might be heading that way. 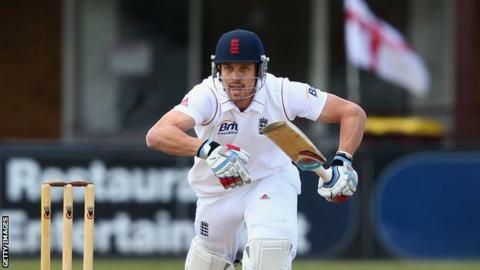 "Playing for England is something I've worked towards since I was 10 years old and it's something I've dreamed about. "When you have those bad years, it's the thing that keeps you pushing on, instead of just throwing in the towel." After an eight-year build up, and the legend of his grandfather hanging over him, you could forgive Compton for feeling the pressure. But one thing he is never short of - along with runs - is confidence. "It will be hard. You're playing in front of 70,000 people, you've got eyes on you and TV presenters clinically analysing your technique - they're the challenges. "But if I can't handle a bit of pressure or a bit more attention, then if you have a dream of playing international cricket it's going to be very difficult. "I've looked upon every distraction as good and thought 'how am I going to handle it today?' and 'is it going to affect me?'. "When you overcome those little challenges, it's only going to give me more and more confidence."